Ductless, mini split-system air-conditioners (mini splits) have numerous potential applications in residential, commercial, and institutional buildings. The most common applications are in multifamily housing, offices, garages, work shops, labs, server rooms and many other areas. The main advantages of Sharkaire mini splits are their small size and flexibility for zoning or heating and cooling individual rooms. They are CO2 safe, ozon and enviroement friendly, ADU ( Accesory Dwelling Unit) and California's Title 24 complaint . For example, the hook-up between the outdoor and indoor units generally requires only a three-inch (~8 centimeter [cm]) hole through a wall for the conduit. If necessary, you can locate the outdoor unit as far away as 50 feet (~15 meters [m]) from the indoor evaporator. This makes it possible to cool rooms on the front side of a building house with the compressor in a more advantageous or inconspicuous place on the outside of the building. A ductless mini-split air conditioner is easier to install than a central air conditioning system. A ductless mini-split air conditioner provides zoned air conditioning without ducting. Super Efficient TOSHIBA Compressor: Compressors are the harth of the air conditioners. Toshiba rotary compressors are provent with their high efficiency and relabilities. We use Toshiba Rotary compressors in every Sharkaire models. Slim, stylish high glossy air handler. We use new technology latest slim and stylish indoor panels for visual enhancement to your room or office. 3D Air Flow: Upward and Downward Air Supply: the fan blade can supply air in three dimensions. Better design provides easy use. Smart Cooling: When the air conditioner is cooling, the cool air will be supplied from your head. Making you always feel natural and cool. Smart Heating: When the air conditioner is heating, the warm air will be supplied to your foot. The down-to-up air supply makes you always feel warm and comfortable. Super-silence technology adopted can reduce the noise up to 20dB, providing silence and comfort. Dual-direction Drainage Pipe Design: The fine design suits our products into different styles of home environment. Intelligent Power Off Sharkaire: Air conditioner is equipped with smart infrared control technology so that it can determine whether there are people inside a room when it is running. When there is no person inside, the air conditioner can shut down the power automatically for energy-saving purpose. ADU stands for Accessory Dwelling Unit and they might just be your next edited home. You might know ADUs by their other, quasi-affectionate names such as granny-flats, mother-in-law-apartments and so on. They are dwellings–either attached or detached from a main house–that exist on a lot with another house. All Sharkaire Mini Splits are ADU complaint and can be install ADU units. Title 24 Complaint: The Energy Commission's energy efficiency standards have saved Californians billions in reduced electricity bills since 1977. These standards conserve electricity and natural gas and prevent the state from having to build more power plants. The Commission accounts for the savings by using forecasting models for residential and commercial energy consumption. The savings are calculated by determining the energy savings associated with a more efficient building standard or appliance. Savings accumulate over time as older equipment and appliances are replaced with newer, more efficient models and older buildings are retired and replaced with new construction. Savings are calculated by multiplying cumulative savings in each year by the average residential or commercial electricity rates in that year. 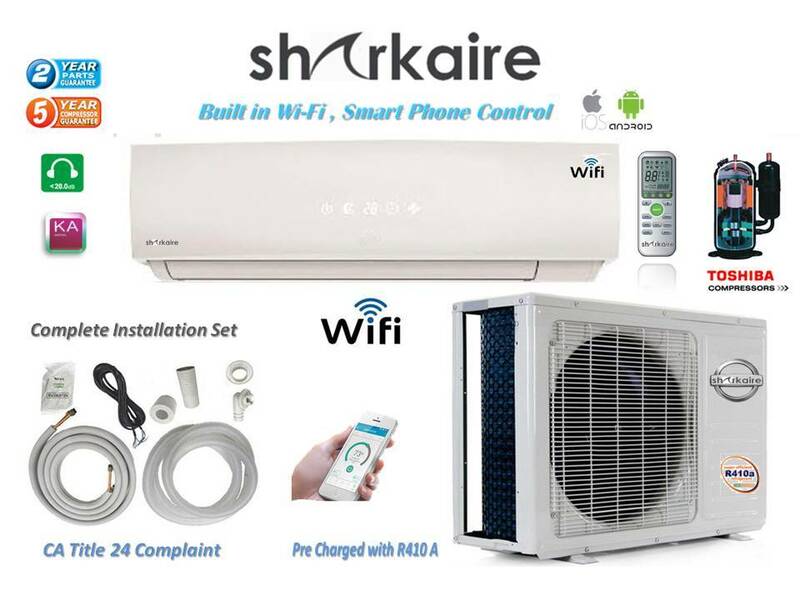 Sharkaire brand air conditioners are always includes " Heat Pump" functionality. They have the self-diagnosing function, which can correctly display the error codes for easy repair and the improvement of repair efficiency and saving cost. We have carefully picked and customized Sharkaire mini split parts and have built them with high quality manufacturing techniques. While working with many different suppliers, we have eliminated the middle man, traders, and other third party vendors that drive the high cost of units. We have also made an investment to technology, stream-lined the shipping process, reduced the waste and other overhead cost. All of these factors have enabled us to offer our Sharkaire products at very affordable prices. We stand behind our product and its quality while offering 5 years of compressor and 2 years of electronics warranty. 5 years on compressor and 2 years warranty on everything else. Buy with confidence through our secure shopping basket. We accept all major credit cards trough PAYPAL payment processing system. PAYPAL card processing "DOES NOT" require PAYPAL account. However you can still use your existing PAYPAL account for quicker checkout.